This page contains some notes on Silver Soldering. I spent some time experimenting with different tools and techniques and this page aims to pass on some of the learning. This is not an extensive essay on the subject but an aid on how to get started. 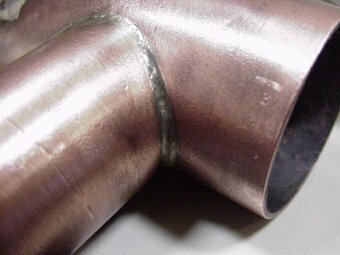 The brazing process can be thought of in three steps. Heat to red hot, and add the brazing rod. The first two steps are very simple. To clean the joint wire wool or a scourer can be used. Both will bring the metal up to a bright shiny finish. To flux the joint, flux power mixed with water into a smooth paste can be applied with a small paintbrush. There are many flux types but if you request some when ordering your brazing rod then you should get an agreeable combination. Remember that wherever you put the flux paste the solder will flow to. So to keep the joint neat and to avoid additional finishing operations, be careful where you apply the flux. The third operation requires a little more attention. To heat the joint two things are required. The photograph below shows a home made hearth. Only materials designed to withstand heat should be used when building a hearth for safety reasons. House bricks for example are not a good choice as they may contain moisture and can explode when heated. This hearth used a layer of firebricks for a base. Firebricks store heat rather than reflect it, so a heat reflective layer of Vermiculite was used as the working surface. Vermiculite is very light and cork like in appearance but reflects the heat well, it is sometimes sold under the brand name of Skomolex. Chronos are one vendor of Skamolex. The use of a hearth is essential for both fire safety and to retain enough heat to successfully braze. For a source of heat a total of 3 different torches are used. 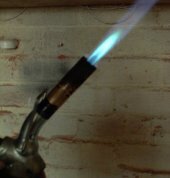 A Sievert torch with separate gas cylinder. 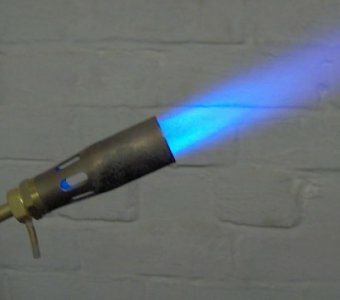 For most jobs the brazing gas torch is used, as it is the cleanest, quickest tool for the job. The simple gas torch (the original purchase) is now seldom used, it is just too weak for most jobs. On brazing jobs with a larger mass, such as a boiler, the Sievert torch is used. The pictures below show the flames produced by each of the torches to give an idea of their output. The simple plumber's torch on the left and the Sievert torch on the right. To get started in brazing the middle torch shown above (sold as a brazing torch) is probably best investment as it is now used for everything but the largest brazing job. Only large boilers or projects with a large mass (such as the poker handle) seem to require the Sievert torch. If you would like more technical detail about any aspects of brazing then this book by Tubal Cain is available. It will tell you everything you need to know about equipment, solder types, fluxes, techniques and more. ** As an example of the benefits of a hearth 2 identical M8 nuts and bolts were brazed together. In the hearth it took 1min 40 seconds to complete the job. In a vice after 5 minutes of work with the gas torch, it still hadn't reached brazing temperature and the test was stopped to avoid wasting gas. The inefficiency was due to the vice removing heat quicker than the torch could supply it. Once the work piece is up to temperature the brazing rod can be added. It is also a good idea to warm the brazing rod in the flame and dip into the flux powder to create a flux coated rod. Once applied to the hot work, the rod should melt and flow to any fluxed area of the joint. As always, practice on a few pieces before attempting to build any finished objects. 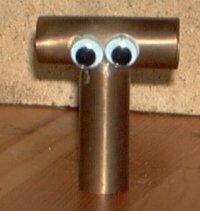 If you've got some odd bits of plumbing copper available you could try joining them like this. It is also worth noting that copper has a higher melting temperature than brass and that brass can be melted if heated beyond a dull red. Aluminium doesn't glow at all, it just melts when it too hot so this takes a lot more practice. Finally to clarify what type of brazing rod is used to build my models. I prefer to use 'Silver-flo 55' brazing rods in preference to 'Easy-flo no 2', as the former is Cadmium free and hence a little less hazardous to use. However both these solders have a similar melting point and will join metals with similar performance. So to get started in Brazing. Buy some 'silver-flo 55' solder sticks and some flux powder to go with it. Buy a gas torch designed for brazing. 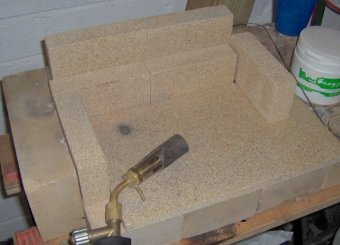 Buy a hearth or some materials to make your own. Get some scrap copper and start practising. Here's what you are aiming for. This joint formed part of a 45psi steam boiler. The joint has a nice fillet of silver-solder and is clean and tidy. The fillet blends into the surface of the work piece indicating that the solder has 'flowed well' and has made a strong joint.